Written by Tom Bentley, has got 3 Comments. I’ve always enjoyed the wide variety of writing/editing I do, but sometimes I fear there’s a haphazard, slapdash aspect to the servings in my copywriter’s restaurant: can you trust a place to make great Chinese if they are advertising pizza too? And though I do OK with the incoming dough, it’s not like I can buy a wheelbarrow of Google stock. Is there a fair fight between freelance generalists vs specialists? Can it be that my “one-size-writes-all” writing biz is too many things: flowers, trees, sky above, dirt below and atomic particles in between? You see, I write web copy, press releases, marketing collateral, ads, case studies, direct mail, and occasionally tech content too. Toss in fiction and essays to this goulash. And I edit all of the aforementioned, and more. In fact, a while back I finished editing a small book on how to play any chord on the banjo. Though twangy, it was quite technical. Let’s look further at the pigeonholing that can take place when writers are sorting out how to best make a living. Copywriters that have a clearly defined niche—“I write sales letters for mid-tier businesses selling nuclear-powered rabbits”—are both constrained by their choices and freed by them. They are constrained in that they may have always dreamed of writing sales letters for nuclear-powered goat companies, but instead they are known as the rabbit guy, and thus they don’t want to dilute their focused offering, and potentially blur the boundaries of their defined space. However, they are freed from casting their “I-need-new-work” lines in the thistle-tangled fields of businesses small, medium and large, who might peddle soap made from recycled comic books, or tongue scrapers for denture wearers. Generalist copywriters tend to a casual work garden of mingled stalks, colors and scents, while the specialist might have a sturdy monocrop of clients and deadline dates. 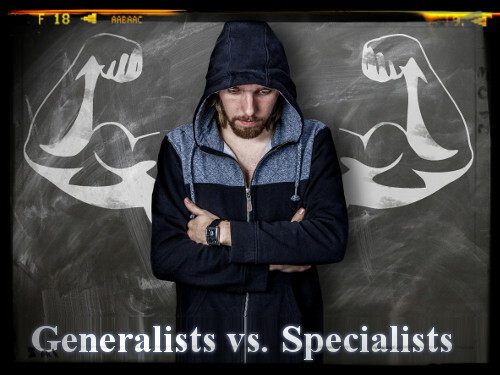 Generalists vs specialists: never to agree? I’ve thought about trying to restrain my 360-degree rotating Exorcist head of writing endeavors, but it’s just not my nature. While I can admire the ferocity of focus some copywriters employ, I can’t join their ranks—I don’t think I could breathe. And, genial bigot that I am, I have to sing the praises of the generalist’s keys, because polymath writing pursuits are inherently interesting for their variety. Now, I have varying degrees of expertise in the areas I listed above, but having written and edited nonfiction books, having written question-and-response dialog for software products, having written three novels and a book of short stories, having written and won awards for many travel pieces, having written many brochures, ads, blog posts—heck, having written lots of grocery lists, I’m confident I can deliver what each organization needs, granting the many iterations of review and rewrite that some projects necessitate. For many writers like me, once you write website copy for a company, they may call you later to write headlines for an ad. However, you’ll find a lot of declarations online from successful creatives that having a niche is key. Every time I read one—because the arguments are sound—I try to reassess my position. My trouble is that as mentioned, I truly love the variety of writing a writer can do, and dabble in so many of its forms. And, well, there are bills to pay, so I don’t make the time to really hone a focus and tune my marketing that way. On the generalists vs specialists clash, Google seems to favor the specialists. Many people who argue for a niche list among their arguments that the greenbacks are greener for the specialist. 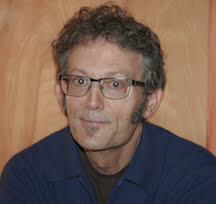 John Soares, the owner of Productive Writers, is a niche advocate. As his post explains (↑), specialists become known as experts, do projects faster and with less research, and pocket more cash. Not bad arguments. Forbes spent some words (↑) trying to convince me that expertise in one area means you can dig deeper than a generalist, and that your unique selling point becomes more precise, plus that your marketing can be tailored to that specialty. And this piece (↑) also has some persuasion about more nickels coming your way with a niche. But what about love? One of the reasons my sweetheart angled to meet me, those many years ago, was because she wanted to meet someone who wrote the back-side descriptions for the photographs on pretty notecards. Guilty. But at the time I, for that successful photographer, I was writing product descriptions, letters to photographic editors and cataloguing images as well. Kept me more intrigued than postcard poetry alone. Yes, I do think there is some danger in the dilution of dilettantism. But my hero, Mark Twain, wrote plays (badly), essays, poems, short stories, novels, advocacy pieces, travel articles, satire, straight journalism, handbills, speeches, jokes—and if you dip your toes into a wide reading pond, you’ll be convinced that he must have sat down and decided to write an entire book of quotations. Some fiction-only writers wrinkle their noses at the taint of the commercial writer, their thought stained by a salesperson’s strain to wiggle widgets at uninterested passersby. Some pedal-floored copywriters breezily dismiss the fevered character/plot/conflict workings of the fiction writer as the strivings of gossamer dreams, without chance for publication or pennies to follow. Both commercial and creative writing can pull from deep sources, draw on emotional layers, and provoke rich thought. And dubbing one “creative” and one not isn’t really accurate. Both can be creative. Or not. Posted by Tom Bentley in Business Strategy, Marketing, Miscellaneous, Top Posts on Thursday, December 7, 2017 has got 3 Comments.